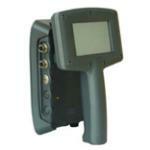 The HR-2 handheld RFID Reader provides fully mobile read/write capability for TagMaster's 2.45 GHz ID-tags. The device is designed for use in a wide range of demanding environments where ID-tags need to be verifi ed and recorded. The combination of this portable RFID device and its touch screen user interface with TagMaster's powerful Linux operating system provides integrators with the fl exibility to customise or enhance the functionality of the HR-2. The HR-2 is used for verifying the stored data and status of an ID-tag or for programming TagMaster ScriptTags. ID-tag information is stored in Flash memory and is easily transferred via Ethernet using the built-in web interface. The HR-2 Reader provides a 2 meter standard read-range which can easily be adjusted using the confi guration menu. Frequency hopping (FHSS) is the default frequency setting which ensures error free operation in close proximity with permanent reader installations. The HR-2 is a robust portable handheld Reader powered by Lithium-ion batteries. By utilising a default stand-by mode, the HR-2 can be operated for a full 10 hour work shift. The Reader becomes fully operational as soon as a reading is initiated via the touch screen. The HR-2 is based on the versatile and proven LR-series hardware platform which includes, Ethernet TCP/IP, RS232 connections, and USB. The Software Development Kit (SDK) can be used for proprietary application development and the open-source HR-2 software can be customised, including the touch-screen interface word-list language. * SDK for custom SW development.